Clinton Eastwood Jr. is an American actor, musician, filmmaker, and political figure. He rose to international fame with his role as the Man with No Name in Italian filmmaker Sergio Leone’s Dollars Trilogy of spaghetti Westerns. Eastwood has been in films such as ‘Dirty Harry’ (1971), ‘Million Dollar Baby’ (2004), and ‘Gran Torino’ (2008). As of 2019, Clinton Eastwood’s net worth is estimated to be roughly $375 million dollars. Eastwood is one of the most well-known actors in history. Clinton ‘Clint’ Eastwood was born in San Francisco on the 31st of May, 1930. Eastwood is the son to Clinton Eastwood, Sr. and Margaret Ruth. While his father was a migrant worker, his mother was employed at a factory. Eastwood attended Oakland Technical High School, and during this time he took up various odd jobs such as a lifeguard, paper carrier, forest firefighter and golf caddy. When he turned 20 years old, he was called for military duty at the Army Special Services. Clint Eastwood appeared for a screen test at the Universal Studios and bagged his first role in the science fiction films, ‘Revenge of the Creature’ and ‘Tarantula’, released in 1955. He later starred in the CBS series, ‘Rawhide’. The series lasted for eight seasons. The movie, ‘Million Dollar Baby’ was released in 2004 and became one of his finest films of all time. The film earned him rave reviews and was a major box office success. It also won several awards, including the Academy Awards. In 2006, Eastwood began to work with Steven Spielberg. They later came up with two films depicting World War II, ‘Flags of the Fathers’ and its sequel ‘letters from Iwo Jima’. Both of the films were well received by the audience. Two years later, Eastwood starred in the film ‘Gran Torino’. The film was a big success at the box office, grossing over $268 million in theatres worldwide. In 2010, the film ‘Hereafter’ was released, and the following year, he released a biopic of FBI director J. Edgar Hoover, which starred Leonardo DiCaprio. As of 2019, Clint Eastwood’s net worth is estimated to be roughly $375 million dollars. View our larger collection of the best Clint Eastwood quotes! 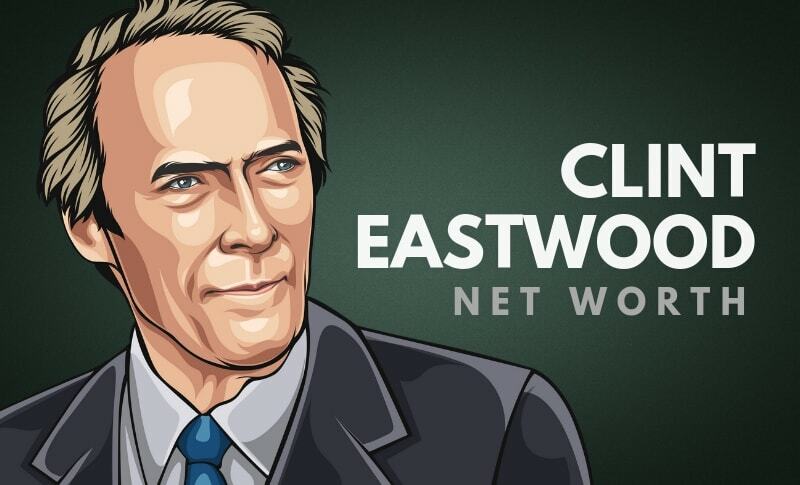 Now that you know all about Clint Eastwood’s net worth, and how he achieved success; let’s take a look at some of the lessons we can learn from him. Understanding an organization’s strengths and weaknesses it essential to success. It’s that understanding that enables a leader to dream big, set the bar high and inspire their people to work hard to make it happen. Don’t be afraid to lead. Regardless of those leaders that may have come before you, it’s your time to shine. Take the opportunity to set direction and manage change. A leader that sets the tone for an enterprise. Your people are watching you. If you operate with good will and demonstrate a willingness to “pitch in” and help those that need help in your business, then your people will recognize that this is a value worth mirroring. From being born in a middle-class family of workers to being the reigning actor-director-producer of Hollywood, Clint Eastwood has had a dreamy uphill career. Eastwood is an incredibly good actor and director, and he has collaborated with some of the best directors, actors, and producers in the film industry. What do you think about Clint Eastwood’s net worth? Leave a comment below.